Are Your Chronic Health Problems Actually Signs of Stress? Research indicates that more than 90% of health issues are related to stress, and that the number of people with chronic stress is increasing. And we’re not just talking about psychological stress; we are also referring to stress as processed foods, toxins in the environment, infections and the overuse of medications. And as these stresses increase in our lives, it is often accompanied by any number of chronic – and often debilitating – health issues. Unfortunately, many of us think of stress as being an inevitable part of modern life. And while doctors may tell you that your health issue is caused by stress, they are often not providing solutions for how to deal with stress or only provide a “quick fix” through prescription medications. Most people attempt to deal with stress by “self-medicating” with alcohol, food, and drugs. NONE of these approaches – least of all resignation and denial – is effective in addressing the issues caused by stress, and that’s why health issues inevitably develop. Let’s face it: stress turns on our genetic tendencies. From Dr. Wilson’s professional experience, she finds that addressing these problem networks as a whole system – rather than looking at them in isolation – can help us find permanent freedom from the stress cycle. PLUS to make your wellness journey even easier (and tastier!) The Stress Remedy also contains 50 pages of recipes – all gluten, egg, dairy and soy FREE – that are all suitable for vegans, vegetarians and non-vegetarians. You’ll also have a 3-week meal plan and tips on living a gluten free life. …then you might be suffering from chronic STRESS. 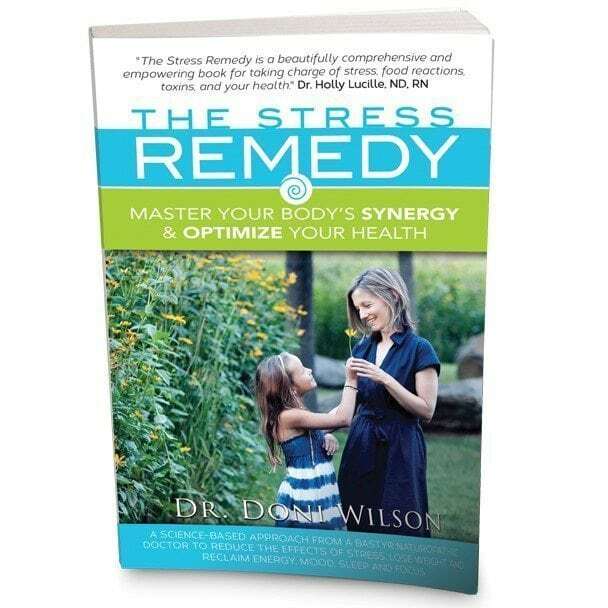 If you’re ready to end the vicious cycle of stress once and for all, and finally (and permanently) reclaim your health, The Stress Remedy by Dr. Doni Wilson is just the book for you. In The Stress Remedy, you will learn the true secret to health: how to give your body all the support it needs so that you can achieve all the energy and vitality of which you are capable. To order a copy of the book, click on the links below. To buy the book in store, please visit Innovative Nutrition in Setauket, NY; St. James Nutrition in St James, NY; ABC Home in NY; or Whole Food in Bowery, NY.